When attorney and civic leader Michael J. Horvitz admitted to the thrill he receives when looking through the glass walls into the beautifully remodeled Cleveland Museum of Art while driving down East Boulevard at night, he was speaking as a proud Clevelander. But he has also played a significant part in bringing the museum's physical plant into the 21st century. In his former roles as president and chairman of the board of trustees of the Cleveland Museum of Art, as well as chair of the building oversight committee and co-chair of the museum’s capital campaign, Horvitz helped to guide almost every phase of the museum’s unprecedented $350 million expansion and renovation, the largest cultural capital project in the history of the state of Ohio. 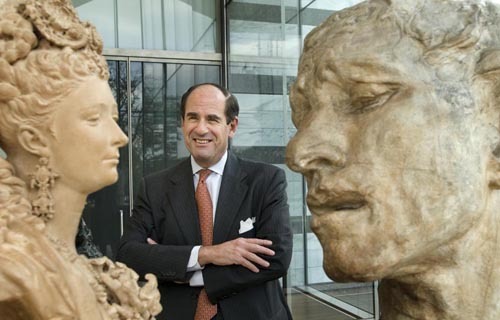 Horvitz, who is of counsel at Jones Day, the Cleveland law firm which he joined in 1980, considers the the Cleveland Museum of Art to be one of the city's world-class assets. A longtime lover of the museum, his relationship with the institution permanently changed when he was appointed to the museum’s board in 1991. Five years later, he was named president, and in 2001 he was elected to the newly created position of chairman. Supporting Cleveland’s great institutions has long been a passion of Horvitz, who also serves as a trustee and member of the executive committee of the Musical Arts Association, which operates The Cleveland Orchestra, and as a trustee of the Cleveland Clinic Foundation and the Jewish Community Federation of Cleveland. He is a past chairman of the University of Virginia Law School Foundation and a former chairman of the board of Health Hill Hospital for Children, which is now part of the Cleveland Clinic Children’s Hospital. He is a former trustee of Case Western Reserve University, the Montefiore Home and Hathaway Brown School. Trying to explain what influences made him so civic-minded would take years of therapy, Horvitz has joked. He believes that everyone is obligated to help the less fortunate whenever possible..
Horvitz, who holds an L.L.M. in taxation from New York University and a J.D. from the University of Virginia, has received prestigious recognition for his altruistic endeavors, including the Nonprofit Board Executive of the Year Pillar Award (2006), National Philanthropy Day Leadership Award from the Association of Fund Raising Professionals (2002), the Gries Family Award for Community Leadership from the Jewish Community Federation (1999) and the Edward F. Meyers Outstanding Hospital Trustee Award from the Center for Health Affairs (1989).